Digital transformation has huge and positive impacts on traditional businesses. The hotel industry is not an exception. In this article, we will look at 5 digital transformation trends in the hotel industry and how they benefit customers and business owners. More and more brands concentrate on mobile-first and mobile-only services which help users complete checking in, ordering room service and even unlocking the room door itself using only their phones. IoT will be a US$14.4 trillion market in the next decade and the number of connected “things” will increase to about 25 billion by 2020. It means that the hospitality industry should take advantages of the data to optimise the customer satisfaction. Obviously, based on what they learn from their customers’ profile, hotels can certainly improve the quality of the service. Digital transformation is a must for the hotel industry. And data plays an essential role in accomplishing this process. 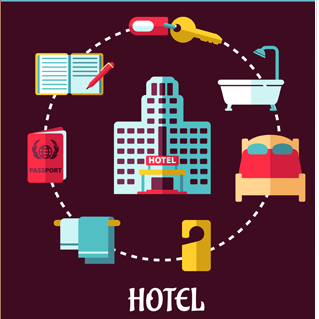 Hotels should use customer data to determine what aspects of their business need to be improved. It is the greatest innovation that enables guests to take a quick look at the property without the need to leave their house. Hotels can now provide their customers with all the information and services they need via AI-powered apps and technology. The information is available all the time in the form of a digital concierge. Users just need to click on their phones to access them. What are the advantages of this transformation? In the case of customers, they can access needed information actively when there are various channels to communicate with the most attractive brand. Information is available on many platforms so that customers can read about it anytime. They can also compare the fee, promotion and read feedbacks of the others about the particular hotel before making the final decision. Finally, booking room and making payment are also finished online in minutes. Hotels also benefit from the digital transformation. Businesses in this industry have applied more mobile solutions in the process of booking and reservations, payments, service enhancement, etc. to improve customer experience. Hotels that offer self-check-in and guidance can reduce queues in place. It results in increased customer satisfaction. There are many communication channels such as Facebook, Instagram, email, etc. that hotel can use to connect with their guests to give them updated information at the right time. In some cases, the hotel managers can take timely actions to control the media crisis. Instead of printing paper forms, key cards, you can get your customers to install a mobile app to accomplish these processes easily. This would be a unique point for your business when the community recently has more demands on green lifestyle to ensure a sustainable growth. When using data analytics, you can get more information related to your customers’ demographic index, preferences, and tastes so as to maximize their experiences by personalizing your offer. Most of your leads and potential customers tend to believe in the reviews of your previous customers on Google, Facebook, TripAdvisor. So try to take advantages of these. Even if they leave you a bad feedback, it is also your chance to express your honesty by clarifying the issues to improve customer satisfaction. Be nice to constructive feedback is the key point at the end of the day. In conclusion, digital transformation will certainly enhance the development of all industries including hotel industry. Therefore, it is essential for all businesses to work hard to provide innovative solutions to their customers who require higher satisfaction and better experience.